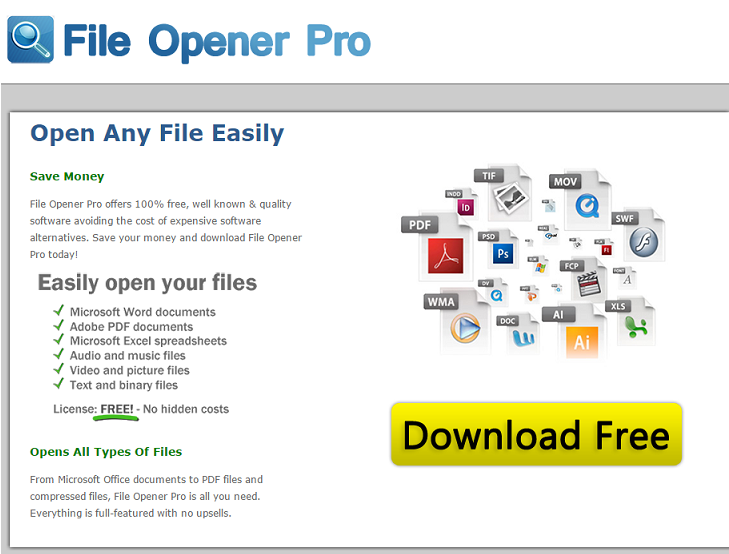 File Opener Pro is promoted as a free utility that allows you to open various types of files including Microsoft Word documents, PDF files, images, audio files, video files, and more. It gets distributed in free software bundles. The application is classified as potentially unwanted for that reason. It is also classified as ad-supported, because it starts flooding you with advertisements as soon as it gets installed. If you want to eliminate its ads from your web browsers, you will have to delete File Opener Pro from your PC. How does File Opener Pro work? As it has already been mentioned, File Opener Pro spreads through free third party software bundles. It does not have an official website, where it could be downloaded. That is never a good sign. Potentially unwanted programs use the bundling method to get distributed, because it allows them to stay unnoticed during the installation process. In most cases, these programs get installed due to the fact that computer users simply do not notice agreeing to installing them. You can avoid such applications, if you simply choose the Advanced setup and decline all additional offers shown to you. We assure you, there is nothing useful about these offers, so you will not miss out on anything. After the installation of File Opener Pro, you will start noticing certain unwanted symptoms. The adware will insert various commercial data into your all of your browsers. You will see pop-ups, banners, hyperlinks, pop-unders, coupons, and other types of ads no matter where you go online. These ads will slow down your online browsing speed. They will also expose you to unreliable content. You could be rerouted to corrupted pages, if you click on them. We advise that you stay away from all advertisements until you terminate File Opener Pro, because you should not risk your computer and personal data safety for no reason. How to remove File Opener Pro? Luckily, it is not that difficult to get rid of File Opener Pro. You can uninstall the application manually or automatically. We advise that you go with automatic File Opener Pro removal option as it is highly likely that you have additional unwanted programs on your PC. Potentially unwanted programs rarely travel alone, and it would be best to remove all of them from your system at once. That is why we suggest that you download the anti-malware tool from our page and scan your system to find all threats that it contains. The security utility will detect all unwanted files and apps and then help you erase File Opener Pro along with other threats. It will also help you keep your computer safe and clean in the future by providing it with real-time online protection and other beneficial features. Alternatively, you can delete File Opener Pro and other unreliable programs manually.